Cantata MPD client released version 2.3.3 a few hours ago with enhancements and many bug-fixes. Here’s how to install it in Ubuntu 18.10, Ubuntu 18.04, Ubuntu 16.04, and Ubuntu 14.04. Add ‘.opus’ to list of recognised extensions for local files. Remove confirmation dialog when saving replaygain tags. Fix saving ‘Descending’ order for smart playlists. Allow .jpeg as extension from cover dialog. Add option to sort smart playlists by title. Change toolbar colours if palette changes. Add more actions to search page results. Fix MusicBrainz disc ID calculation. And various other changes, see the release page for details. 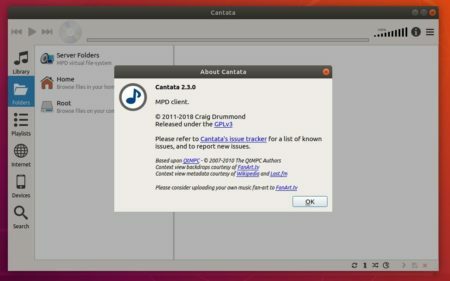 For all current Ubuntu releases, you can install Cantata 2.3.3 via the unofficial PPA. Input user password (no asterisks feedback while typing) when it prompts and hit Enter. For Ubuntu 18.04 and higher, skip sudo apt-get update as it’s done while adding the PPA. To remove the PPA repository, launch Software & Updates utility and navigate to Other Software tab. 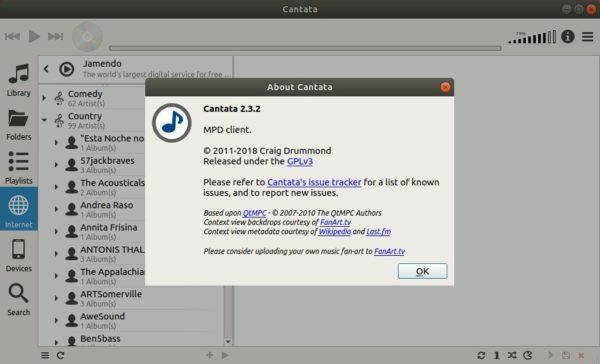 Cantata MPD client 2.3.2 was released a few days ago. Now you can easily install it via PPA in Ubuntu 18.04, Ubuntu 16.04, Ubuntu 14.04, and derivatives. When using Track Organizer to rename music tracks, rename any other files that have the same basename as the music file. Install cantata.png to use as Windows tray icon. Remove internal Samba share mounting code, this had some privilege escalation issues, and is not well tested. Use 32-bit unsigned int to store output IDs. When marking podcast episodes for download, and ‘show only unplayed’ is checked, then only download unplayed episodes. Fix smart playlists with a rating range and no song include/exclude rules. Enable proxy config settings page by default. Fix ‘Locate In Library / Album’ for albums with musicbrainz ID. Check HTTP stream URLs are valid URLs, and scheme starts with http. Due to reports of crashes in libvlc code, default to using QtMultiMedia for HTTP stream playback on Linux builds (already default for Mac/Win). Use “:/” as root path for windows folder browse, seems to then list each drive. If a dynamic playlist has rating 0..5 stars, then include all songs (even those without an explicit rating). Ubuntu icon theme is now named Yaru, so install there. Don’t install Yaru icon by default. For all current Ubuntu releases, you can install Cantata 2.3.2 via the unofficial PPA. Input your password (no asterisks feedback while typing) when it prompts and hit Enter. 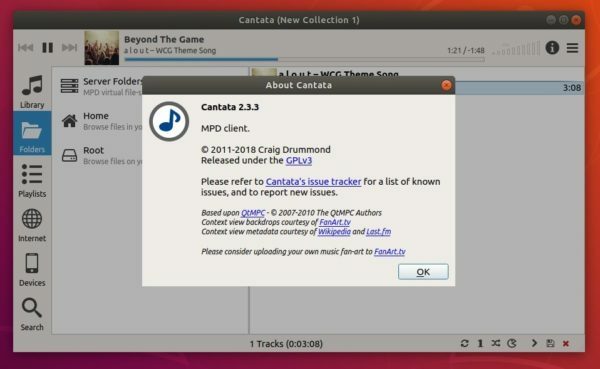 Qt5 graphical MPD client Cantata 2.3.1 was released earlier today. Here’s how to install it in Ubuntu 18.04, Ubuntu 17.10, Ubuntu 16.04, and/or Ubuntu 14.04. Fix enabling of add/replace play queue actions for Jamendo/Magnatune. Use JSON to encode song details when adding online tracks. Fix crash if try to expand dirble and --no-network passed to Cantata. Remove custom icon theme, and just use FontAwesome. Add genius.com to list of lyrics providers. Fix playback of downloaded podcasts. Fix saving of podcast images to JPG. Limit SoundCloud results to 200 matches. Add file max-age to dynamic playlist rules. Some UI improvements, and translation updates. 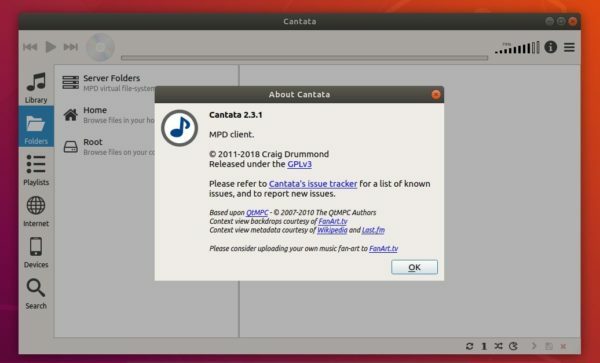 For all current Ubuntu releases, you can install Cantata 2.3.1 via the unofficial PPA. Cantata MPD client 2.3.0 was released a day ago with a large list of changes. Here’s how to install it in Ubuntu 18.04, Ubuntu 17.10, Ubuntu 16.04, and/or Ubuntu 14.04. Only disable system tray support if org.kde.StatusNotifierWatcher is not registered when running under Gnome. Add “Add Local Files” to playqueue context menu. Add support for forked-DAAP – thanks to Wolfgang Scherer. Reduce memory usage by correctly calculating cost of covers for in-memory cache. Use IO::Socket::IP and not IO::Socket::INET in cantata-dynamic to allow usage with IPv6. Enable remote (sshfs, samba) device support by default for Linux builds. Make track links in context view work with CUE files. Support dragging folder of music files onto playqueue. Support dragging m3u and m3u8 playlists onto playqueue. Add ‘Categorized’ view for albums in library. Add settings page to configure API keys. Add Suru icon for Ubuntu builds. And there are various other changes, see HERE for details. For all current Ubuntu releases, you can install Cantata 2.3.0 via the unofficial PPA. To remove the PPA repository, launch “Software & Updates” utility and navigate to Other Software tab. 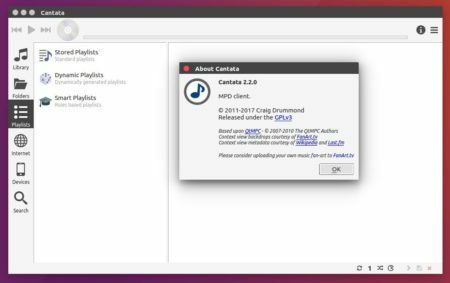 Cantata, an open-source graphical MPD client, reached 2.2.0 release earlier today. Here’s how to install it in Ubuntu 14.04, Ubuntu 16.04, Ubuntu 17.04, Ubuntu 17.10 and their derivatives. Add option to specify number of play queue tracks for dynamic playlists. Add option to set application style. Fix potential issue with priority menu items being disabled. Remove unity menu icon work-around. Fix desktop detection via XDG_CURRENT_DESKTOP – check for colon separated values. In playlists page, internet, etc, allow back navigation to go fully back. Smart playlists – like dynamic, but do not auto update. Use em-dash to as separator. Add device option to only transcode if source is FLAC or WAV. Fix some potential security issues. Fix sidebar highlight for windows (at least for Windows 10). Only enable system tray for Linux if org.kde.StatusNotifierWatcher DBUS service is registered. Fix MPRIS can go next/previous state changes. 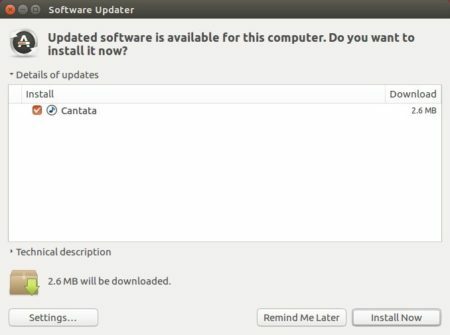 Besides building from source, all current Ubuntu users can install Cantata 2.2.0 via an unofficial PPA.